Market direction: DOWN, but support may be found soon (in the 730s if 750 breaks). In such high volatility environment, lower intraday time frames are doing fine. The picture is however pretty good on this snapshot too. Entropy is stabilising on moderately low levels, but the bearish MTFS lines have quite negative gradients indicating RUT going lower, thus pushing support level also lower (730?). Definitely no chance of a recovery in the short term. Should 750 break, the next Fib level is around 731 (close to August lows), but this scenario is now becoming quite realistic. Note: we've had a channel since mid 2003 which could break, so we should remain cautious. Breaking 731 would be however alarming. Entropy and MTFS both still point down or just a congestion within the current trading range. Lows around current pivot level (143.75) have been tested. 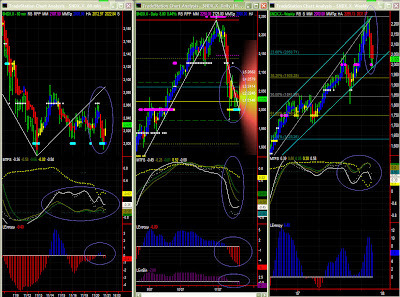 We now have to see how the MTFS bearish pattern develops until lines meet. No real recovery potential in the short term. MTFS and Entropy do not look good and at this stage it is likely that the fall will continue until MTFS lines meet. 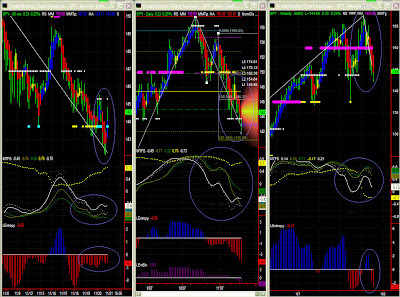 MTFS may indicate a congestion around current lows. SPY could eventually fall further to 141 (Fib) or even 137.50 (MM). However the current fall in Entropy is not too alarming (see LEntBin), so congestion may happen on this support level. AutoFib already gives potential recovery levels (L1 to L5) if current pivot holds. Definite congestion ahead. Bias remains down, so behaviour on 2000 is obviously key. MTFS and Entropy both look fairly bearish and 2000 had to be tested. We indeed have conflicting information arising from the MM level showing a reinforced support level. The MTFS white line has started showing some inflexion, so there will be more fighting on the 2000 support level. 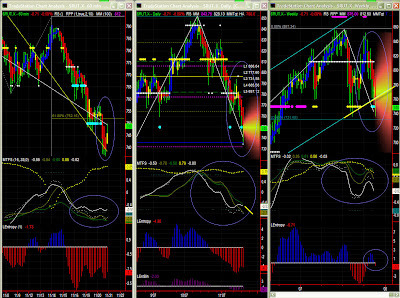 Please note that the MTFS pattern has to complete with lines joining almost always in oversold territory. This indicates a potential to go somewhat lower, or at least a long battle (3 or 4 days min).